LANZHOU - An ancient bronze mirror from the Wei and Jin Dynasties (220-420) was stolen from a Dunhuang museum in northwest China's Gansu Province, a curator confirmed on Wednesday. The Dunhuang Municipal Museum reported the theft to local police as soon as it found the mirror missing in the daytime of August 24, when the building was open to tourists. Police were investigating the case, curator Fu Licheng said. The mirror, 11 cm in diameter and a mere 0.3 cm thick, was rated a Class A heritage cultural property under national protection. The Chinese characters "Wei Zhi San Gong," roughly meaning "among top ranking officials," was inscribed on the back of the mirror. 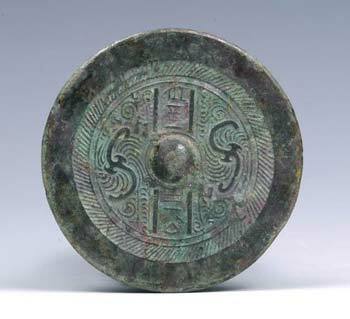 A number of bronze mirrors have been unearthed in the Hexi Corridor region in Gansu Province in recent years, but the stolen one was among the best preserved. However, the missing mirror could not compare with relics in the Mogao Grottoes in Dunhuang in terms of historic value, according to Fu. Three other ancient bronze mirrors of lesser value were also stolen from the municipal museum. Fu said the museum's sole infrared security system was operational the evening before the theft occurred. In the daytime, however, all cultural relics were guarded by security personnel. A new building for the museum is under construction. Gansu has so far this year reported six thefts of cultural relics, including one from another museum, before the case involving the Dunhuang Municipal Museum, according to a recent circular from the provincial bureau of cultural relics. Under a local regulation that took effect on August 1, the theft of a Class A cultural property is regarded as an extremely serious case and investigations must conclude within two months. Dunhuang was a historic junction of the Northern and Southern Silk Roads. For centuries, Buddhist monks at Dunhuang collected scriptures from the West and pilgrims traveling along the famous silk road to the West painted murals inside the Mogao Caves to form the world-famous grottoes.